The Little Gardeners range gives plenty of inspiration and ideas for children to have fun with as they learn to grow flowers and vegetables from seed. 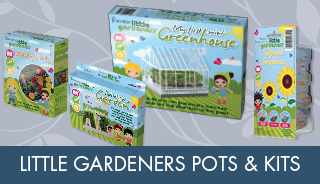 Aimed at children from 3 to 11 years old this range includes packets of easy to grow seeds, through to a mini greenhouse kit to assemble and grow plants in. Every item in the range has something for children to grow but there are also extra games and activities for them to enjoy that includes facts they will be learning about in school at Key Stage 2 (ages 7 to 11). The colourful and fun packet design appeals to a younger audience, while the growing information and activity ideas are simple, easy to follow and an ideal way of getting all Little Gardeners outside! 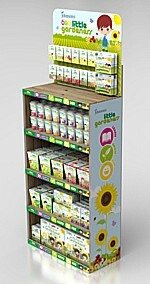 Little Gardeners can also join in the fun on their very own website www.little-gardeners.co.uk which combines fun and facts with easy to navigate areas and uses the colourful and distinctive design from the Little Gardeners packaging. Features of the site include a Fun Zone, with games and a quiz and the Little Gardeners’ Academy where children can learn about the science of seeds and the importance of garden wildlife. There is a Meet the Gang page where they can find out more about the Little Gardeners characters and a section to highlight the Little Gardeners product range.